Whether you have a vintage classic leather jacket, one with a designer label or a prized motorcycle style, the following cleaning tips for a leather jacket will keep yours looking great for many years to come. Although most of the leather jackets sold today are preconditioned, taking the time to give it special care when you bring it home will help ensure that you will enjoy it through many years of wear. When you get your jacket home, apply a leather conditioner and waterproofing product. Doing this will help keep your beautiful jacket looking its best well into the future. Apply the product by rubbing a light coating of leather conditioner, or mink oil, into the entire jacket making sure not to apply too much or it will feel sticky or slimy. Proper care for a new jacket helps to keep the leather strong and prevents it from cracking, drying and ripping. It also keeps it feeling and looking wonderful while maintaining that special leather smell. A leather jacket needs to be cleaned and reconditioned once each year. If your jacket has a smooth surface, wipe the entire jacket surface using a soap or detergent that is mild. Use a damp sponge to rinse the jacket and blot up any excess water. Hang the jacket up to dry in a place that has a lot of air circulation. To recondition the leather jacket, and prevent it from becoming dried out and subject to damage from the elements, reapply the conditioner and waterproofing product the same way you did when the jacket was new. Always be sure to do a spot test before using any cleaning materials on leather to make sure the leather will not be damaged. Do this by applying a small amount of the of the cleaner on an inconspicuous area of the jacket and let it set for approximately ten minutes. Check to make sure there is not any damage to the area. Getting ink on a leather jacket can be a very upsetting experience. But there is a way to remove the ink stains from the leather using a non-acetone nail polish remover. Scrub the ink spot for approximately 45 seconds with a sponge dampened with hot water. Dry the areas well with a clean cloth. Apply the non-acetone nail polish remover using a cotton ball. Rub the area with the cotton ball using a medium amount of pressure. Dry any remaining nail polish remover from the area. Another method of removing ink from leather is using rubbing alcohol, which is called isopropyl alcohol. Dip a cotton ball into the alcohol. Rub the area using a circular motion until the ink is removed. Use a good leather conditioner or moisturizer to restore the moisture content to the leather. 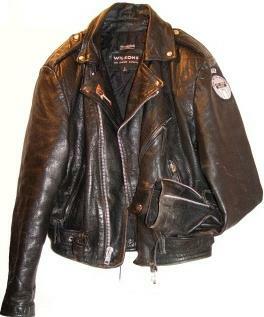 Removing mold or mildew from a leather jacket is a simple task using a solution of ½ rubbing alcohol and ½ water. Apply the mixture to the area of the mold a or mildew using a white, clean cloth or put the mixture into a spray bottle and spray the area. Coat the area with a light coating. Use another white clean cloth and dry the area thoroughly. Allow the jacket to dry completely before placing it in direct sunlight. If your favorite leather motorcycle jacket has stains from road salt, mix a solution of ½ white vinegar and ½ sterilized water. Rub the solution over the jacket using a clean white cloth. Always hang a leather jacket up on a wooden or padded hanger. Using a wire hanger or a thin plastic one can cause indentations or damage to the leather. Folding the jacket may cause creases to form in the leather. If your jacket does have creases from being folded, hang it in the bathroom and run a hot shower. The steam will cause the creases to relax. Do not hang the jacket under the spray of water from the shower. Another method used to remove creases from a leather jacket is ironing it using a layer of heavy paper between the iron and the jacket. Make certain the iron is set to a low setting. A popular product called Lexol is used for automobile leather. This product can also be used on leather jackets. Following the cleaning tips for a leather jacket will keep your jacket in great condition giving you years of wearing pleasure.